While your basic blue denim will never go out of fashion, the lovers of this fabric have reasons to hoard more this year. This fabric, which was originally designed to make robust work-wear for cowboys and miners, has now come back into mainstream fashion and how! Everyone, from Burberry to Kenzo, LV to Tommy Hilfiger, have something in denim to offer this Spring-Summer. What was seen on the runway was denim shirts, jackets, overalls, and really long denim skirts. 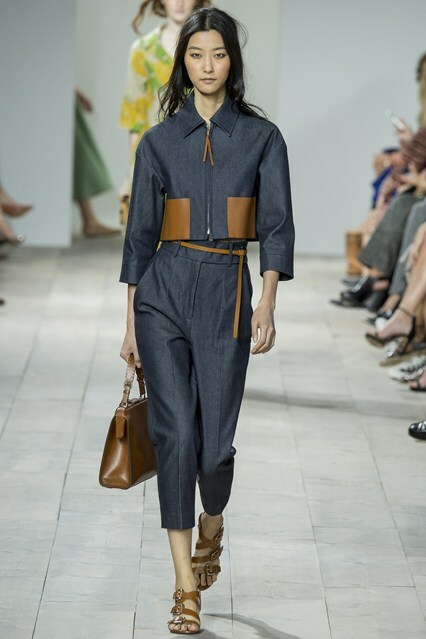 Denim was also explored in culottes and dresses of different lengths. A lot of experiments were done with patchwork, especially in Burberry designs. Of course, our ever favourite skinny jeans remained on the scene, along with boyfriend jeans and bootcuts too. Top-to-bottom denim is a trend to look out for, as the likes of Michael Kors and Fendi came out with looks putting together denim top, denim jackets and a loose denim bottom. I see myself wearing this in the near future! It seems so wearable! 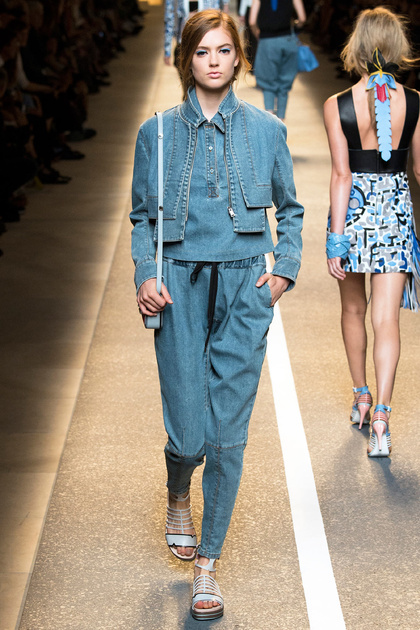 Denim dungarees have made a huge comeback too, along with jumpsuits. The trend is going to remain huge this year, and methinks denim trench coats are something I would love to flaunt beginning fall! The shade family to explore remains the classic blues in various hues: ice blue or black-blue, chambre, and the evergreen (or should I say ever-blue!) indigo blue. White denim is completely back in vogue, and you must try it out if you can take care of the pristine color! While patchwork and embroidered denim did come back with a bang, I would suggest that you try these only if you can carry this elaborate look with elan, or you could look too made-up. Denim featured in accessories and footwear too! 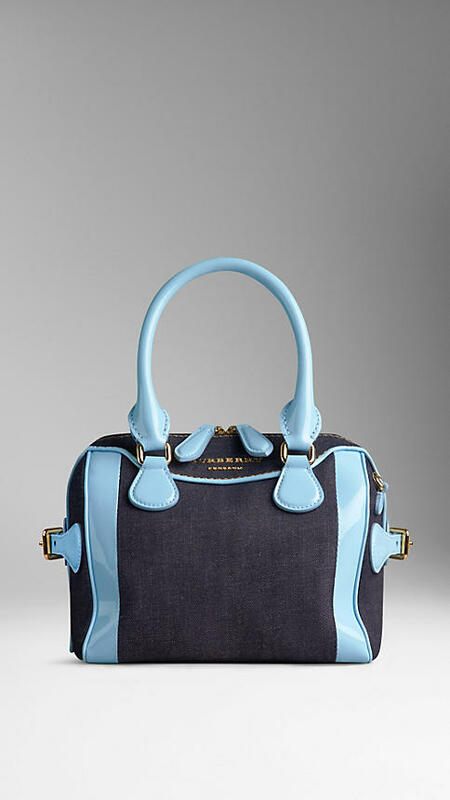 Check out this Burberry bag! If you really want to try a frilly or lacy denim piece, or one with embellishments, then keep the rest of the outfit simple. Accessorize! Since denim is a very casual and laidback fabric, I highly recommend that you enhance your glamour quotient with your accessories. Wear your blingy gold/rose gold watches and chunky bracelets, add something on your neck and wear pumps. If you’re not in the mood for heels, then wear any glamorous looking flat sandals. You’ll be the head-turner, my guarantee! Almost all our favourite high-street brands have rolled up their (denim!) sleeves and come out with a ton of variety of denimwear in their Spring-Summer collection. So go splurge on denim this season. It surely is the hottest thing to sport! 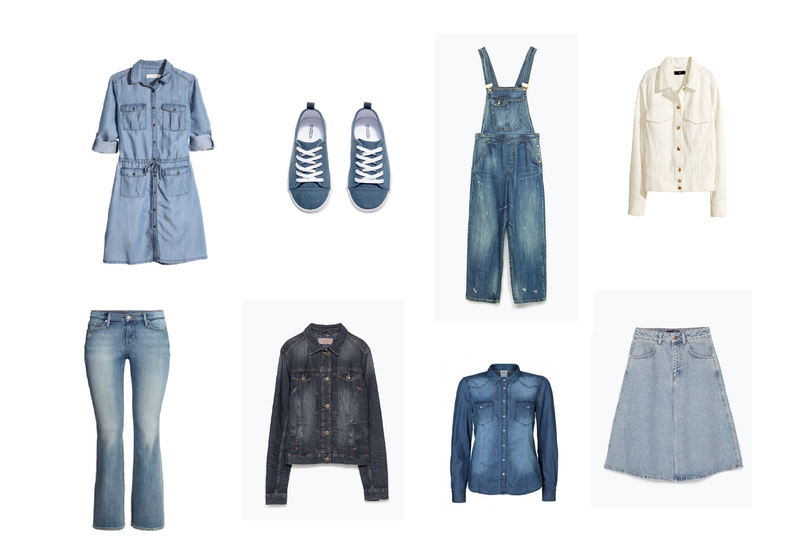 How are you sporting denim this season? Do drop your comments! And you can now ‘Like’ Fashion Food Soul on Facebook to have regular updates with such awesome posts! I love denim and I will definitely be rocking it this spring season. Great post Poorva! Haven’t seen you for awhile. I have a lot of denim shirts. I’m not big on skirts but I have some really nice jackets I picked up from a thrift shop. Maybe I should do a OFOTD for the AARP (American Association of Retired Persons) crowd, in all denim! Wait, that might involve elastic waist pants, oh never mind. Hahaha! I’ll be waiting for this outfit post very eagerly ☺ but I feel denim is for everyone.. Irrespective of age or gender..if worn well it looks good on anyone! What a great (fashion) news! Thank you for sharing it!